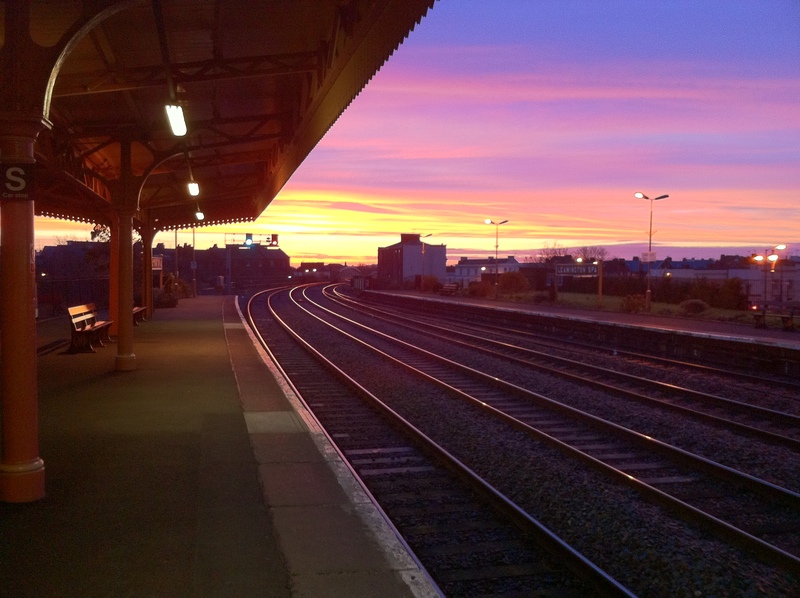 Pretty soon I’ll be giving up my daily Leamington Spa to London commute (more on that in a later blog post), so I thought I’d share this picture I took at the station this morning to show that it does have some nice moments. On a recent trip to London my girlfriend and I visited the Saatchi Gallery (superb gallery, you must go if you’re in the area), where I was mesmerised by a piece in their store called “The Clock Clock” by humans since 1982. Check out this video of it, it’s amazing. I thought that it would make a really cool little HTML5 experiment, so I gave it a go.You can view it here, but you’d do well to fire up the latest version of Chrome, Safari or Firefox first. I’ve reached out to humans since 1982 to see what they think of it, but haven’t heard anything back yet. It was announced last week that the company I work for, thrudigital, had been acquired by idio, a company we’d had a close relationship with for some time. As a result, I, along with the rest of thrudigital, will be joining the idio development team as their “London office”. Primarily, my work for idio will focus on their platform, which deals with content aggregation, analytics, personalisation and distribution, and making improvements to help it scale. Very exciting stuff, so look out for some scalability related topics on here in the near future! Here’s a quick link to a post I put up on the thrudigital blog the other day, regarding a little technique I came up with to allow CakePHP to disambiguate between slugs and controller actions in routes. You can check the post out here. Enjoy! I posted on our company blog today about a CakePHP helper I wrote which allows you to make the most of the PHP date() and strftime() methods in one function. You can check out the blog post here, or grab the source code on Github. 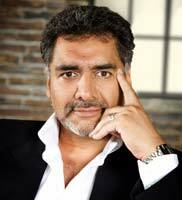 For a period of over a month during October and November 2010, I was stalked across the internet by none other than James Caan, the multi-millionaire businessman and Dragon. He was advertising a one-day seminar entitled “James Caan’s Total Business Mastery” through a company called EBA which took place on November 27th. During the stalking period, almost any site I browsed which served up Google Ads (of which there are one or two) would display James’ smiling face, inviting me to purchase a ticket so I could learn to be more entrepreneurial. Sometimes there were as many as 3 of these adverts on a single page. I noticed the trend sometime in early October, and made many comments about it in the office. It became something of an internal meme, and I assumed it would pass soon. In late October, it was apparent that the ad was sticking with me for a while, so I began to keep a tally of how many I saw in a day. Obviously, this tally is dependent on a number of factors, mostly how much I browsed the net that day (which isn’t necessarily a direct correlation to the amount of work I got done that day, of course…), and days I wasn’t in the office since I only saw them on my work computer, but it still makes for (vaguely) interesting statistics. A more interesting statistic would have been the ratio of pages which served Google Ads to the number of those which served James Caan adverts, but hey, I’m not made of tally charts, am I? 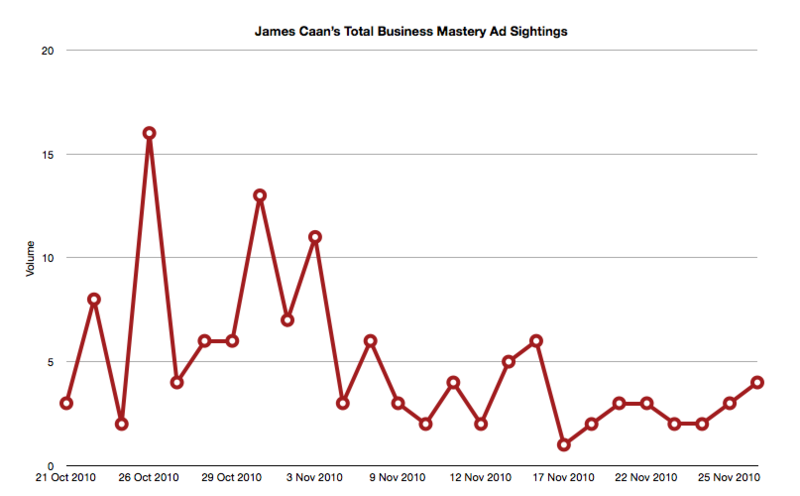 Between October 21st and November 26th 2010, I recorded 127 individual sightings of adverts for James Caan’s Total Business Mastery, averaging 4 a day, or 5 per work day. The most I saw in a single day was 16, and the minimum (not counting the rare days that I saw none) was 1. The mode of the dataset was 3, and the median was 3.5. Enough stats already, give me a freakin’ graph! OK.
All this has made me wonder – is this normal? I can’t help but think that it is. Perhaps normally I simply ignore it, and that it was only James Caan’s happy smiling face that made me notice this particular ad campaign. I haven’t noticed any more Adsense stalkings since this one, but, as I say, I may be immune to them unless they have pictures of James Caan on them. Which leads me to wonder – is it only James Caan’s face I’ll respond to? Google, in the interests of science, can you serve me up some ads with Tina Fey on them? Thanks muchly. As an aside, did anyone actually go to the seminar? Was it any good? I can’t help but think that it undersold, since the ads proclaimed ‘limited space available!’ yet they served me ads up until the day before the event. Update: Turns out he’s doing another one in January, and I’m seeing adverts again. I’m taking tallies, so expect another update soon. Today I’ve hacked together and launched my own Twitter-bot, @chinesetwispers. The basic premise is that it finds tweets with certain words in them, replaces those words for other words which either sound like the word or are generally hilarious replacements, and then retweets it at the original author. I’m looking forward to seeing what it comes out with – hopefully no-one will get too offended! 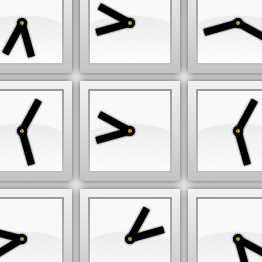 As well as that, I’ve done some work on Twipestry, so it’s now a load more stable and produces more relevant results. As well as that it now uses the search API, meaning instead of just searching for users you can also do keyword-based searches as well. Lovely, no? If a Conversation has no records in the join table, then the People involved in the Conversation is assumed to be all the people in the Meeting. This seemed alright, but Cake was throwing me error after error, and it took me a while to figure out what was going on. It turns out that when you perform a HABTM find in Cake, it expects to always see a join table. This is especially apparent when you select a group of rows, since it then uses the values in the join table to determine which row is associated with which model. In the example above, Cake was expecting to always see two fields, one called ConversationPerson.conversation_id and another called ConversationPerson.person_id. Obviously, in the cases where the association exists in the join table, this is fine. However, no associations exist and we grab the data from the MeetingPerson table, Cake is unhappy. Unfortunately, Cake isn’t clever enough to look for those ids (conversation_id and person_id) in the other fields it returns, it explicitly wants them to come from a table called ConversationPeople. In retrospect, I should have just bitten the bullet and populated the ConversationPerson table with the values from MeetingPerson (or perhaps gone one step further and inferred the people in the meeting from the people involved in Conversations in that meeting, but whatever), but in this case I think this was probably the nicest solution. The example in this post is so incredibly edge-case that it will probably help absolutely no-one, but I thought I’d put it up anyway, since the Cake docs don’t mention requiring those particular fields when specifying a finderQuery. I came across an interesting bug in IE6 the other day, and couldn’t find any documentation of it on the internet, so thought I’d share it with you all here (aren’t you lucky?). I found that the bug didn’t occur if I escape()‘d the value before I passed it into the textfield. It seems, therefore, that IE6 has an issue with strings that contain HTML content – presumably it was trying to parse the HTML when it was put in the textfield. The same behaviour was observed when using document.getElementById(…).innerHTML = value; as well. My trusty old 1st-gen MacBook Pro died on me last week, so I’ve got myself a shiny new one, which is exciting! One thing I was looking forward to was a clean install of the OS, so I could re-appraise the way I used my computer. One of the things I decided to do was to move away from using XAMPP and have a more traditional set up using the built-in Web Sharing. Here, I’m going to talk about what I’ve done and how I propose to use my new laptop for Web Development to smooth my workflow. Mac OS X Snow Leopard comes with Apache and PHP, although PHP is disabled by default. I didn’t know this to begin with, so I started off by installing Marc Liyanage’s PHP bundle. However, after installing this I found that I was getting 301 “Permanently Moved” errors on all my pages, so that was soon uninstalled. To enable PHP on Snow Leopard, you need to open the config file in your favourite text editor (mine’s TextMate, but you can use vim, nano, or any other). In a terminal, open the file for editing (replacing ‘mate’ with the command for your text editor) entering your password when prompted. Call this file info.php, and then in your browser navigate to http://localhost/~yourusername/info.php – if it’s worked then you should see a nice table which has all the details of the PHP installation. If, like me, you’re going to be using MySQL for the database side of your web applications, then you’re in luck! It’s really easy to install, since MySQL provide some lovely .dmgs. Go to http://dev.mysql.com/downloads/mysql/ and choose the DMG archive most appropriate for you (remember to check your operating system version, and whether your computer is 32 or 64 bit). Note that all of these downloads are for Intel-based Macs only. When you’ve got the file, open it up and you’ll see 4 files. Start by installing the main MySQL application which will be called something like mysql-5.1.50-osx10.6-x86_64.pkg. When that’s done, I installed the MySQLStartupItem.pkg and the MySQL.prefPane files (both done by double clicking on them), which starts the MySQL server when I login and lets me control it through the System Preferences application. You can manage the database in a number of ways, but I choose to use SequelPro. It’s a free application that’s got all the features you need in a lovely Cocoa-based UI. If you prefer, you could install phpMyAdmin or one of a number of alternatives, but I haven’t tried those so I shan’t give you any advice on them. Now all’s that’s left is to knuckle down and write some code – and let’s face it, isn’t that why we’re all here? Ach, couldn't send the message. Give it another go. ©2014 imaginaryroots. All Rights Reserved.